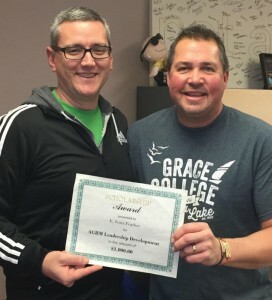 Scott Feather, left, is the recipient of the first AGBM Scholoarship for Continued Education. Jon Damon, right, aided in the process for him to receive this scholarship. AGBM has awarded it’s first Scholarship for Continued Education to E. Scott Feather in the amount of $1,000. A mentor/equipper of his, Jon Damon, aided in the process for him to receive this scholarship. Scott is the lead pastor at Gateway Church, a Grace Brethren congregation in Parkesburg, Pa.
“We are excited to be a part of Scott’s growth and development as he continues in ministry,” says Matt Wheelock, Interim Pastoral Ministry Director for AGBM.